When I was a child we used to go to the Italian Dolomite Alps. Every year, in December, we stayed in a beautiful village in the Alta Badia region called Corvara. I loved being there as it looked like a wintery fairy tale (I always had a weak spot for places like this). Old wooden houses, trees packed with thick snow and the most amazing Tyrolean food – my childhood heaven. Yesterday I thought about how much I would love to be in the mountains again, in a wooden hut with an open fire and lots of snow outside. I would sit at a rustic old wooden table and eat rustic food. Although I will not be visiting Corvara this winter, at least I have the wooden table and the hearty food. Therefore, my Wednesday Sandwich has to be a mountain sandwich – kind of – rich, with ham and cheese, homemade plum chutney and ground pepper. 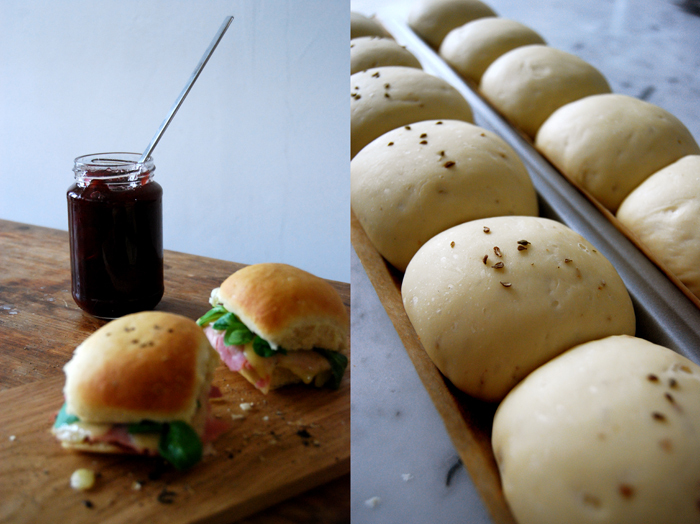 This morning, I baked my own buns with coriander and aniseed and I got some nice ham and cheese. I made a plum chutney with lots of spices a couple months ago which is great together with cold cuts and mountain cheese. You could also use any other chutney or even plum butter, you just need something that adds a bit of fruity sweetness to this sandwich. 2 buns or 4 thick slices of bread, 2 slices of ham, 6 thin slices of strong mountain cheese like Swiss Appenzeller, plum chutney, a few leaves of lettuce (I used field salad as I had some left) and some crushed pepper. Set your oven to grill (highest temperature). 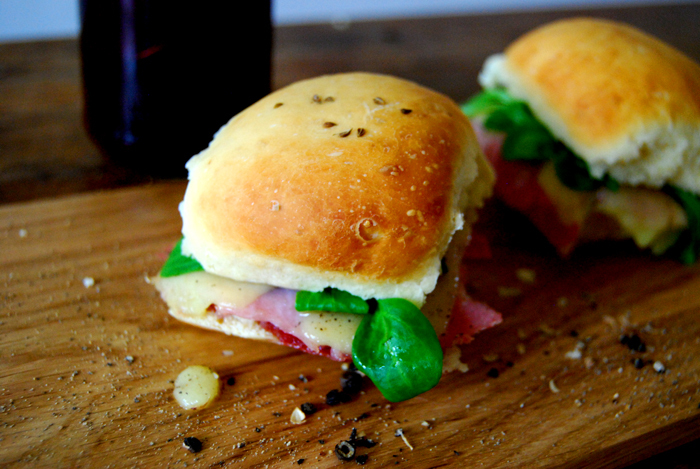 Cut the bun in half, spread the chutney thinly on one half and put a slice of ham on top. Cover with 3 slices of cheese and put in the oven until the cheese starts to melt. Take the bun out, sprinkle with pepper, add some lettuce and put the other half of your bun on top. I know it’s a bit of work, but baking your own bread or buns is definitely worth the effort and I’m sure you will agree after your first bite of the warm and fluffy buns. I prepared mine last night and let the dough rise overnight. Then you just have to put the buns into shape the next morning, let them rise for 40 minutes and bake them. If you want them plain just leave out the coriander and aniseed, they are still delicious! Combine the flour with the yeast, coriander, sugar and salt. Mix the milk with the melted butter and the egg. Mind the temperature as the mixture should be lukewarm. Pour the liquid mixture into the flour and start mixing with your dough hooks for around 10 minutes until you have an elastic dough ball. Put the dough on a floured working surface and continue kneading with your hands for a couple minutes. When I prepare the dough in the evening I place it in a clean, buttered and covered bowl in the fridge and let it rise overnight. 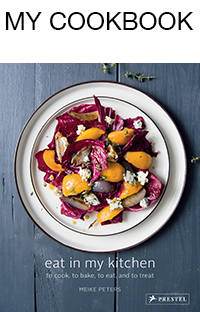 You will have to take it out of the fridge 30 minutes before you can continue with the next steps. In case I want to bake my buns the same day, I put the dough in a clean and buttered bowl, cover it with a tea towel and let it rise in the 35°C / 95°F warm oven for 60 minutes. This works really well but make sure that your oven is set to top/ bottom heat and not to fan. Set your oven to 220°C / 430°F and prepare a baking sheet with parchment paper. When the dough is bigger and puffy punch it down and knead for 1-2 minutes. Cut into 12 pieces and roll them in your hands into a round shape. Place the buns on your baking sheet, sprinkle with anisseed and give them another 40 minutes in a warm place to rise again (covered with a tea towel). Bake the buns for 6 minutes, take the temperature down to 200°C / 390°F and bake them for another 7-10 minutes or until golden brown. Let them cool for a couple minutes. Jetzt brauche ich aber noch ganz dringend das Chutney-Rezept! 🙂 Und Gratulation zum Artikel in der Zeit!! Duerfte ich das Chutney-Rezept auch haben? Ich würde tippen Du machst es nicht zu süß (wie die meisten)… Ich würde sogar vllt Zwetschgen hernehmen…. Ich hätte es gern fruchtig und nicht zu süß.. Thank you Marigene! 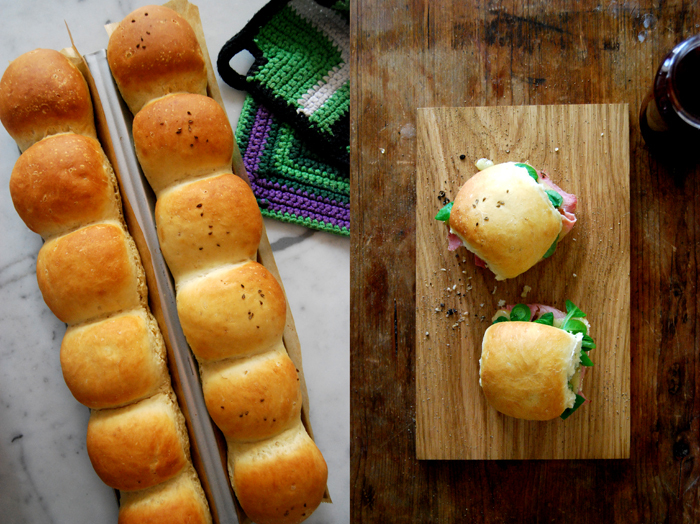 They were delicious, I love the smell of freshly baked bread and buns in the house!